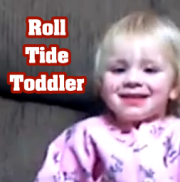 Video: Roll Tide Toddler Picks Alabama To Beat LSU by 20 Points! This Roll Tide toddler is picking Bama to beat LSU by 20 pts (with the help of daddy). Its cute, check it out. I am sure you know a Roll Tide Toddler too.